This bottle tree holds 88 bottles. A convenient way to store and bottle your beer or wine. Rinse the bottles out well after use and store upside down on the bottle tree where they remain clean. When you want to bottle, use a sanitizing solution, such as Star San or SaniClean, to sanitize your bottles. Wait 1 minute and bottle. You can also do the sanitizing ahead of time and let the bottles air dry upside down. Consider adding the matching sanitizer injector below for a complete bottling package. 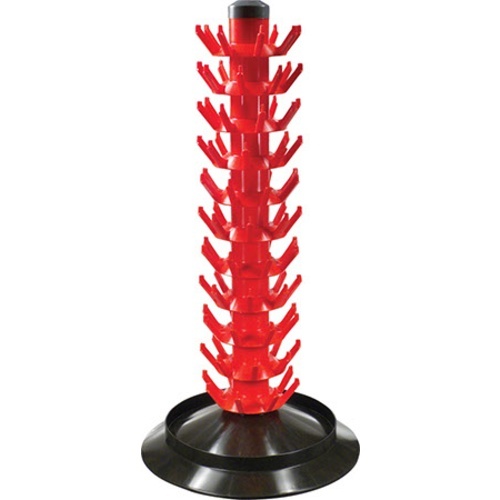 The injector sits atop the bottle tree and makes sanitizing a breeze! What we at MoreBeer! like about this particular bottle tree is how each section screws together. In most bottle trees the sections are a flush fit which results in a little bit of give or sway when the whole unit is assembled. This model is rock solid and feels very secure. appears to be a good product for drying 22oz bottles. Great, strong tree. The sections individually thread together, so you can make it however tall you want. Loaded it up with 22s, a few 750s, and see no signs of sag or stress on the plastic. For the low cost of the extra rows I see no reason to buy the smaller tree. Plastic injection mold quality - 7/10 - burrs and overmolding here and there, no voids or heat stress. Value 10/10 - Great deal. For who is wondering I am using it with the injector B521. This tree is waaaayy too tall with all the levels attached to use the tree + injector on a tabletop. You can just sit the injector on the table instead and it will be sturdy.